Reviewed by Shera – 5 of 5 #SevinHeaven Stars! 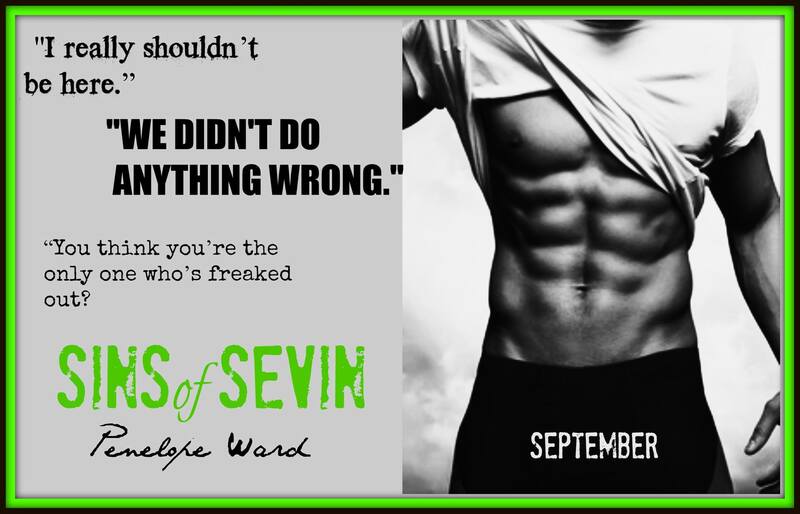 Sins of Sevin by Penelope Ward is a different kind of forbidden romance read. It was beautiful, angsty, humorous, gut wrenching and brilliantly written. I shed more than a few tears while reading this one and my heart literally hurt. This was a book that when I picked it up I didn’t stop until I got to the very last page. You couldn’t pry me away from my kindle. Sins of Sevin is full of twists, turns and a whole heap of different emotions. You will laugh, you sure as hell WILL cry and you will feel the pain and grief that Sevin is living. But you won’t just feel for him. You will hurt for Elle and more specifically Evangeline, her sister. The pain of what she is willing to give up and walk away from in order to not hurt her sister. There is only one problem. You just can’t deny the chemistry between two people. When it’s that strong and there is that much pull, you can try to walk away, you can try to run but your heart will always stay where it belongs, even if your body doesn’t. I am a forbidden romance lover. I seek out the ones that aren’t traditional, I was looking for something different and this one did the trick. There was so much chemistry between Evangeline and Sevin you could FEEL it through the words. It was as if it was seeping right out of my kindle and straight to my heart. No denying these two belonged together, they needed each other. No lies, only truths, they could be themselves when they were together. They were each other’s “person”. But that wasn’t the way it was “meant” to be, at least not in the eyes of others. I don’t think I need to go into any more detail than that. This is a book you MUST read. While I could sit here and breakdown the entire story for you I won’t because I want you to experience this first hand. You need to feel the words and fall in love the beautiful writing of the ever talented Penelope Ward. Once again she delivers an amazing read. This book will pull you every which way. You will feel hope, loss, devastation, hurt and love. Everything a book should have, you will find in Sins of Sevin! But have tissues ready, you’ll need them for sure.